The absurdist spirit of Russian Futurism infuses this work which otherwise resembles a commercial website gone amok. While certain sections feel like conventional narrative literature, others include invitations to imagery theater events, warped Google searches, a manifesto addressed to the future of humanity, a propagandistic movie in support of "Monad Technologies" and other less-definable digital genres. Whether this work is a cry from the past or from the margins of today, the Modernist communicative logic of broadcasting has clearly succumbed to the more prevalent logic of communication today: participation culture. 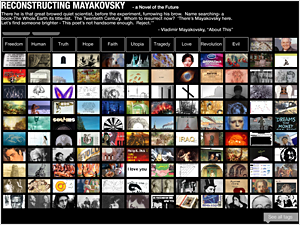 While September 11th is evoked as an illustration for why we need to think "beyond the human" because people gum up the perfections of (military) technology, Reconstructing Mayakovsky as a whole corrupts the panoptic logic of the database, the 19th century novel and the internet itself. Author description: Inspired by the poet Vladimir Mayakovsky who killed himself in 1930 at the age of thirty-six, this hybrid media novel imagines a dystopia where uncertainty and discord have been eliminated through technology. The text employs storylines derived from lowbrow genre fiction: historical fiction, science fiction, the detective novel, and film. These kitsch narratives are then destabilized by combining idiosyncratic, lyrical poetic language with machine-driven forms of communication: hyperlinks, "cut-and-paste" appropriations, repetitions, and translations (OnewOrd language is English translated into French and back again using the Babelfish program.) In having to re-synthesize a coherent narrative, the reader is obliged to recognize herself as an accomplice in the creation of stories whether these be novels, histories, news accounts, or ideologies. The text is accessed through various mechanisms: a navigable soundscape of pod casts, an archive with real-time Google image search function, a manifesto, an animation and power point video, proposals for theatrical performances, and mechanism b which presents the novel in ten randomly chosen words with their frequencies. Following in the tradition of Russian Futurism, the site adopts a "do-it-yourself," "art-in-the-streets" aesthetic that privileges ready-made code, found media objects, and thought and language games over high-tech wizardry. Instructions: This project requires a live internet connection to function properly. Previous publication/additional credits: June 2008. Web Design and Development: Cloudred / Art for animation and graphic design for manifesto: Pelin Kirca / Original music for animation: Itir Saran.